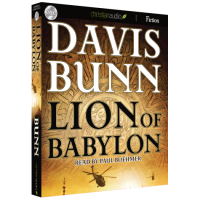 Until the end of this month, you can get a FREE audio copy (.mp3, .m4b) of the novel Lion of Babylon by Davis Bunn from Christianaudio.com. Every month they give away a free audiobook and this is the one for the month of July. Over the past couple of years, we have been able to get books by John Piper, Jerry Bridges, J. I. Packer, Mark Driscoll, R.C. Sproul, Matt Chandler, and many others, all for free in audio format. Marc Royce works for the State Department on special assignments, most of them rather routine, until two CIA operatives go missing in Iraq–kidnapped by Taliban forces bent on generating chaos in the region. Two others also drop out of sight–a high-placed Iraqi civilian and an American woman providing humanitarian aid. Are the disappearances linked? Rumors circulate in a whirl of misinformation. Marc must unravel the truth in a covert operation requiring utmost secrecy–from both the Americans and the insurgents. But even more secret than the undercover operation is the underground dialogue taking place between sworn enemies. Will the ultimate Reconciler between ancient enemies, current foes, and fanatical religious factions be heard? Please Note: You no longer need an account with Christianaudio.com to download their monthly free audiobook. You simply need to give your email address, and then you have access to the files. As before, they do not require billing information for free products.